Composed by Stephen Weber. Contemporary Classical. Score, Solo Part. 25 pages. Published by Published by Dr. Stephen Weber (S0.225091). 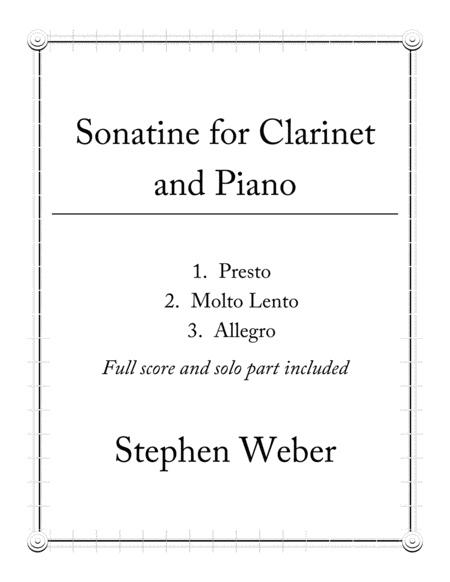 Sonatine for Clarinet is a three-movement work for advanced clarinetists. 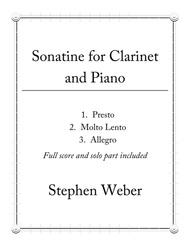 The sonatina is comprised of three movements, Presto, Molto Lento, and Allegro, and is eleven minutes in length. The work is ideal for concert performance and is quite virtuosic, both for the soloist and the pianist. Composer Stephen Weber is Professor of Music and chair of the Arts and Humanities division at the University of Science and Arts of Oklahoma. He is a member of ASCAP and has his own YouTube channel, at which you can hear performances of his compositions here in the U.S., in Europe, and in Asia.